In this article, I am going to explore – "How to get the information about the control which caused post back in ASP.NET". For this purpose, I am going to access "__EVENTTARGET" element. I will also explain "__EVENTTARGET" in detail. In this article, I am going to use "__EVENTTARGET" element. If you ever see HTML source code of an ASP.NET page carefully, you would have noticed a hidden input tag added to the form after a postback (see the picture below). 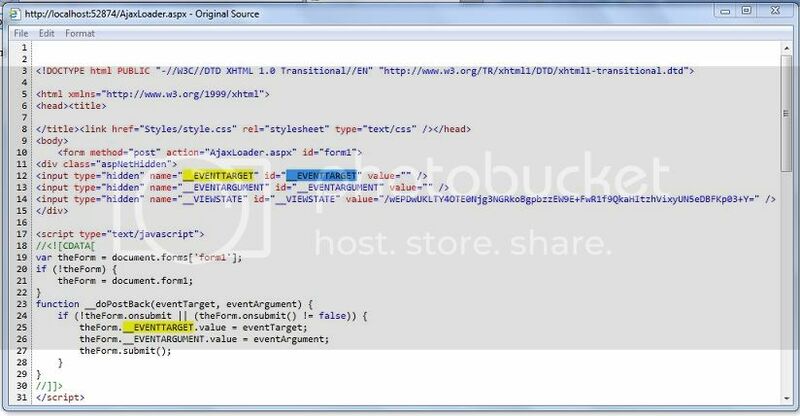 The __EVENTTARGET is a hidden variable that tells the server, which control is actually responsible for event which caused a postback, so that the .Net framework can fire the server side event for that control. We are going to access this hidden input element “__EVENTTARGET” to accomplish our goal. This element can be found in the Form Collections. Here, we need to take care about one thing. If the postback is done by a Button control, then the page actually gets submitted and no postback occurs. The reason is, a button is rendered as <input type=”submit”> tag and is get added to the Form collection of the page. Now, our "wbControl" object is the control which actually caused the postback. You can get other information about the control by accessing its attributes like wbControl.ID etc. UpdatePanel is used for partial post back of the page and the article is about "determining the control which caused post back". There are many controls that fires server side event. The article is all about getting the information of that control which actually fired server side event. As far as web services are concerned,in general terms, they are used for sharing information out side the scope of the application.